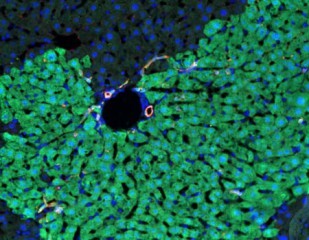 Hybrid hepatocytes (green) expand during chronic liver damage. The mechanisms that allow the liver to repair and regenerate itself have long been a matter of debate. Now researchers at University of California, San Diego School of Medicine have discovered a population of liver cells that are better at regenerating liver tissue than ordinary liver cells, or hepatocytes. The study, published August 13 in Cell, is the first to identify these so-called “hybrid hepatocytes,” and show that they are able to regenerate liver tissue without giving rise to cancer. While most of the work described in the study was done in mouse models, the researchers also found similar cells in human livers. Of all major organs, the liver has the highest capacity to regenerate — that’s why many liver diseases, including cirrhosis and hepatitis, can often be cured by transplanting a piece of liver from a healthy donor. The liver’s regenerative properties were previously credited to a population of adult stem cells known as oval cells. But recent studies concluded that oval cells don’t give rise to hepatocytes; instead, they develop into bile duct cells. These findings prompted researchers to begin looking elsewhere for the source of new hepatocytes in liver regeneration. Meanwhile, many other research labs around the world are working on ways to use induced pluripotent stem cells (iPSCs) to repopulate diseased livers and prevent liver failure. “Although hybrid hepatocytes are not stem cells, thus far they seem to be the most effective in rescuing a diseased liver from complete failure,” said Joan Font-Burgada, PhD, postdoctoral researcher in Karin’s lab and first author of the study. While iPSCs hold a lot of promise for regenerative medicine, it can be difficult to ensure that they stop proliferating when their therapeutic job is done. As a result, iPSCs carry a high risk of giving rise to tumors. To test the safety of hybrid hepatocytes, Karin’s team examined three different mouse models of liver cancer. They found no signs of hybrid hepatocytes in any of the tumors, leading the researchers to conclude that these cells don’t contribute to liver cancer caused by obesity-induced hepatitis or chemical carcinogens. Co-authors of this study also include Shabnam Shalapour, Atsushi Umemura, Koji Taniguchi, Mark A. Valasek, Maike Sander, and Hannah Carter, UC San Diego; Suvasini Ramaswamy, and Inder M. Verma, Salk Institute for Biological Studies; Brian Hsueh, Karl Deisseroth, and Li Ye, Howard Hughes Medical Institute and Stanford University; David Rossell, University of Warwick; Hayato Nakagawa, UC San Diego and University of Tokyo; and Janel L. Kopp, UC San Diego and University of British Columbia. This research was funded by the National Institutes of Health, including the Superfund Research Program at the National Institute of Environmental Health Sciences (grants CA118165, CA155120, P30 CA014195-38, F32CA136124, ES010337, HL053670, AI048034, DK078803 and DK068471), California Institute for Regenerative Medicine, Rotary Foundation, Uehara Memorial Foundation, German Research Foundation, Japan Society for the Promotion of Science, Japanese Society of Gastroenterology, Tokyo Society of Medical Sciences, Kanae Foundation for the Promotion of Medical Science, Frances C. Berger Foundation, Leona M. and Harry B. Helmsley Charitable Trust and JDRF. Newly Discovered Cells Regenerate Liver Tissue Without Forming Tumors. Appl Rad Oncol.